If you’re inspired to get fit or simply want an amazing activity to take your mind off work, it’s time to think outside of the box. This year we’re loving exercise and there are more activities on offer than ever before from climbing to Cross-Fit. So while you could opt for the familiar andtake up running, swimming or get back into a gym routine; there are plenty of other cool ways that you can burn calories while having a lot of fun. Many of them involve making use of modern technology. Here are some of the hottest ways of getting active this year. Chances are that you already own a traditional bike. But an electric bike can take your cycling to another level. This super modern set of wheels will allow you to ride harder and faster than ever before. 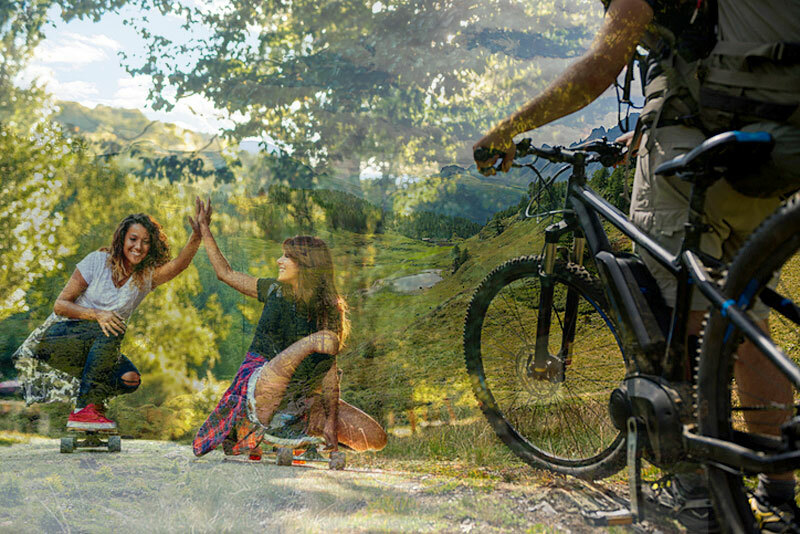 You’ll still be peddling but if you choose to, you’ll have the option of having the integrated motor help you up the steepest hills or to make that last home stretch go by easier. It makes it possible to do long distance cycle rides on your weekends, knowing that you’ll have enough juice left to get back safely. You can buy anything from electric city bikes to electric mountain bikes, so it’s definitely worth exploring this new popular activity. Are you already into skateboarding or ice skating? Maybe it’s time to finally try out an electric skateboard. As with electric bikes, electric skateboards will let you ride faster and for longer. You can still do all your tricks as these futuristic boards are lightweight and made from durable materials like bamboo. A hand-held controller will allow you to speed up and come to a safe stop. You can get a slick electric skateboard for cruising around your city streets or a robust long board for taking out on the beachfront or country roads. Either way, you’ll soon be obsessed. If you’re a gym buff, this will excite you. Gyms across the country are starting to incorporate virtual reality (VR) technology into their kit. That means that you can literally take your workout to another world. Already loved by gamers, VR technology will make your gym routine a lot more fun. It’ll motivate you to hit more targets or to compete against other gym goers. It takes a little getting used to, but there’s nothing more effective than combining games with workouts. So the next time you see a VR gym, go ask for a try out. Whatever way you choose to get in shape this year, find something that works for you. It’s a good idea to try out various sports and activities, as that’s the only way you’ll find something that you’ll love. If you already know that you enjoy riding a bike or a skateboard then go try out the modern versions that give you performance at another level. Consistency is always key.